A bacterial disease of plants in the rose family in which blossoms, new shoots, twigs and limbs die back as though they have been burned. 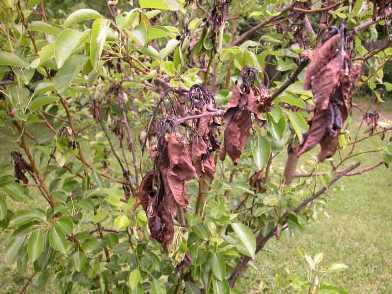 Leaves usually remain attached but often turn black or dark brown. Prune back into healthy tissue and disinfect pruning tools with a 3-5 percent solution of hydrogen peroxide. Spray plants at first sign of disease with Garrett Juice plus garlic and/or neem. Consan 20 and agricultural streptomycin are also effective controls. Kocide 101 is a copper based fungicide often recommended, some consider this organic, I don’t. The best recommendation is to spray Garrett Juice plus garlic, treat the soil with horticultural cornmeal, apply the Sick Tree Treatment and reduce the nitrogen fertilizer. High-nitrogen, synthetic fertilizers are the primary cause of this disease. Spray plants at first sign of disease with a 50/50 mixture of 3% hydrogen peroxide and water or Bio Wash (to clean plants). BioSafe is an excellent commercial product. 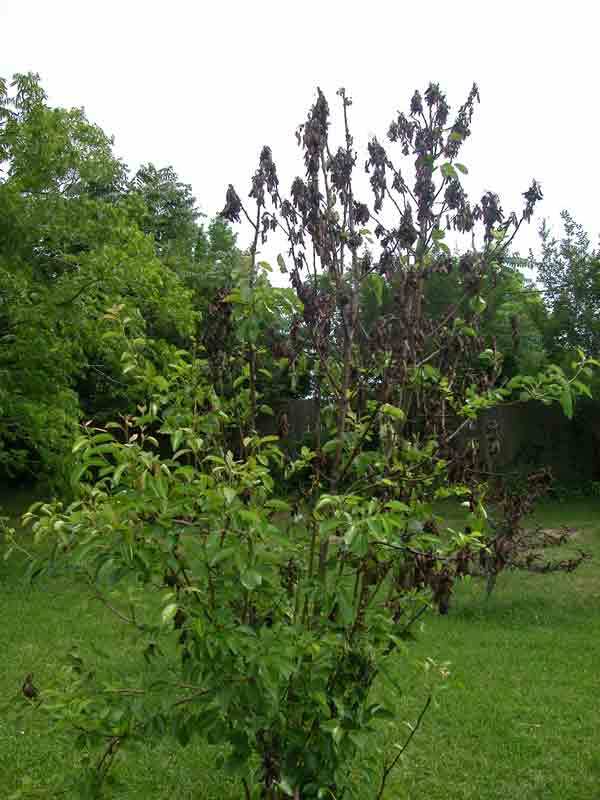 Treat plants with the Sick Tree Treatment and cut back on the amount of nitrogen fertilizer. Prune back into healthy tissue and disinfect pruning tools with a 3 % solution of hydrogen peroxide. Spray plants at first sign of disease with Garrett Juice plus garlic and/or neem. Consan 20 and agricultural streptomycin are also effective controls. Kocide 101 is a copper based fungicide often recommended, some consider this organic, we don’t. Treat the soil with whole ground cornmeal, or apply the entire Sick Tree Treatment and reduce the nitrogen fertilizer. High-nitrogen, synthetic fertilizers are the primary cause of this disease. Hydrogen peroxide (3% spray) is effective against most all bacterial diseases and works well on fire blight. Many trees with this problem are too deep in the ground. Bio Wash is also an effective tool for this disease.